Heparin-induced thrombocytopenia type II is a rare but devastating complication of heparin exposure. We review a case of a 66-year-old female who underwent aortic valve surgery requiring venoarterial extracorporeal membranous oxygenation (ECMO) support postoperatively. She subsequently developed acute renal failure due to bilateral renal vein thromboses and thrombocytopenia and was found to have platelet factor 4/heparin antibodies and was diagnosed with heparin-induced thrombocytopenia (HIT). She was transitioned to nonheparin anticoagulation and her thrombocytopenia improved. Although a rare complication of anticoagulation, diagnosing HIT in a patient on ECMO requires a high index of suspicion and should be considered. Veno-arterial extracorporeal membranous oxygenation (VA-ECMO) is a method of providing cardiopulmonary support through a circuit that typically consists of a venous/or drainage cannula for deoxygenated blood, an extracorporeal pump and oxygenator, and a return cannula delivering oxygenated blood into the systemic arterial circulation. As blood passes through numerous nonbiologic surfaces, systemic anticoagulation is nearly always required. Heparin is a common choice due to its short half-life and reversibility, however, exposure to systemic anticoagulation also makes complications from anticoagulation commonplace. We present a case of heparin-induced thrombocytopenia while on systemic heparin anticoagulation resulting in severe thrombocytopenia and acute renal failure due to bilateral renal vein thromboses. A 66-year-old female with bicuspid aortic valve and severe aortic stenosis presented for aortic valve replacement. Her medical history included hypertension, dyslipidemia, and type 2 diabetes mellitus. Preoperative transthoracic echocardiogram demonstrated a severely calcified bicuspid aortic valve with mean gradient of 53 mmHg and valve area of 0.99 cm2, with left ventricular (LV) ejection fraction of 71% and grade 2/4 diastolic dysfunction. The right ventricular size and function were normal. Preoperative angiography demonstrated normal coronary arteries. She underwent aortic valve replacement with a 19 mm St. Jude Trifecta valve (St. Jude, Little Canada, MN, USA) under general anesthesia with standard lines. She received 400 units per kilogram of unfractionated heparin (UFH) for cardiopulmonary bypass (CPB). The surgery was technically challenging due to a small aortic annulus and friable tissues, requiring an extended CPB run. A saphenous vein graft to the left anterior descending artery was performed due to possible occlusion by the prosthetic valve. Hemodynamics were satisfactory throughout the case, and her total urine output was 5.2 L. Post procedure, transesophageal echocardiography (TEE) demonstrated severe LV dysfunction with implanted valve failure; hence, she was placed on VA-ECMO through central cannulation from the right atrium to ascending aorta. The prosthetic valve appeared to be seated correctly; however, on TEE, the valve did not appear to open. In the Intensive Care Unit (ICU), she continued to have bleeding on postoperative day (POD) 1; hence, she was not systemically anticoagulated. TEE demonstrated thickened prosthetic valve cusps with echo density and minimal opening of the aortic valve suggesting thrombus. 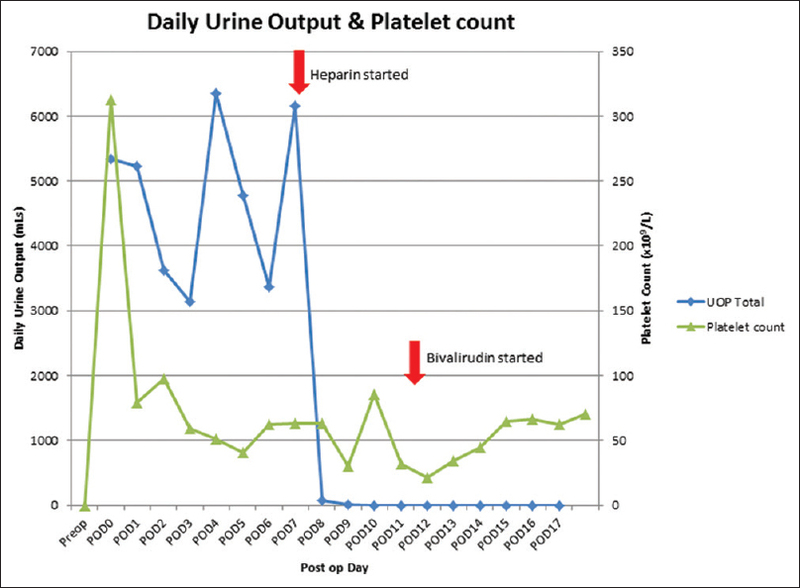 By POD 2, her bleeding had significantly improved and systemic bivalirudin, our usual ECMO anticoagulation was initiated to an activated partial thromboplastin time goal of 80 s. At this point, her renal indices were within normal limits (urine output, creatinine, and blood urea nitrogen). From POD 3 through 7, her ECMO support remained stable (ECMO cardiac index 2.2–2.4 L/min/m2) without major clinical events and had a reassuring neurologic examination when off sedation (followed commands and moving all extremities). A furosemide infusion maintained daily urine output from 3.1 L to 6.1 L and her plasma creatinine peaked at 0.3 mg/dL [Figure 1]. During this period, she received 1 unit of apheresis platelets for a count of 41 × 109/L and 1 unit of packed red blood cells for hemoglobin of 7.8 g/dL. On POD 8, an attempt to convert from ECMO to LV assist device was aborted due to worsening prosthetic valve thrombus obstructing ejection so her ECMO circuit was exchanged on CPB after 400 units/kg UFH and due to surgical preference and concern for inadequate anticoagulation, her postoperative anticoagulation was changed from bivalirudin to UFH. Within 24 h, she developed sudden anuria, and her creatinine increased from 0.3 mg/dL to 1.5 mg/dL, requiring continuous renal replacement therapy. Doppler ultrasound demonstrated bilaterally patent renal arteries without flow through either renal vein, suggesting bilateral renal vein thrombosis [Figure 2]. She concurrently developed worsening thrombocytopenia from 63 × 109/L to 30 × 109/L requiring 5 units of apheresis platelets to maintain a count above 50 × 109/L, however, it continued to drop to a nadir of 21 × 109/L [Figure 1]. The differential diagnosis for her thrombocytopenia and renal vein thromboses included prosthetic valve thrombus embolization (unlikely without systemic arterial thromboses and venous renal thrombi), renal hypoperfusion (unlikely with stable hemodynamics), disseminated intravascular coagulation (unlikely with normal coagulation parameters except for thrombocytopenia), and heparin-induced thrombocytopenia (HIT). With refractory thrombocytopenia, bilateral renal vein thrombosis and reexposure to heparin, a HIT assay was performed (Immucor, Peachtree Corners, GA, USA) and was positive (OD 1.602, serum reactivity for platelet factor 4 (PF4)/H complexes, inhibited by high-dose heparin). We do not normally perform a serotonin release assay unless testing is inconsistent with the clinical history. With high clinical suspicion and positive assay, she was diagnosed with HIT. Her anticoagulation was transitioned back to bivalirudin with improvement of platelet count without transfusion [Figure 1]. By POD 13, she clinically deteriorated and no longer followed commands (Glasgow Coma Scale [GCS] 6), and by POD 14, she was unresponsive (GCS 3). On POD 15, repeat ultrasound demonstrated bilateral patent renal arteries but could not comment on the renal veins due to ECMO interference, and CT angiogram demonstrated patent renal arteries. On POD 16, CT demonstrated a right posterior communicating artery infarct. Unfortunately, her multiorgan failure worsened despite maximum medical and mechanical support and per the family's request consistent with the patient's wishes; organ support was withdrawn on POD 17. Heparin-induced thrombocytopenia is an uncommon immune-mediated adverse drug reaction whereby an antibody-mediated complex through PF4 and heparin activates platelets which leads to sudden thrombocytopenia (platelets count <50% of baseline) and paradoxically is profoundly prothrombotic with 50%–75% of confirmed cases developing thrombosis.,, Critically ill patients often have many reasons to develop thrombocytopenia, and only about 1% of ICU thrombocytopenia is HIT related, so providers must maintain a high index of suspicion. A common preanalytical scoring system, the 4T score, stratifies to low, intermediate, and high risk by assessing the degree of thrombocytopenia, its timing relative to heparin exposure, thrombosis, and absence of other causes of thrombocytopenia (which is often impossible to rule out in ECMO patients) [Table 1]., Confirmatory serologic testing involves immunoassays for antibodies to PF4-heparin and/or functional tests of platelet activation. However, these are time-consuming with results often returning after treatment. Patients following cardiac surgery commonly exhibit thrombocytopenia and heparin exposure so evidence of thrombosis becomes increasingly important in making the diagnosis. We diagnosed our patient with HIT due to high probability 4T score (7/8) with confirmed PF4/H antibodies. Although uncommon, HIT has been described in patients on ECMO resulting in deep vein thrombosis, pulmonary embolism, ischemic necrosis of the limbs and bowel, large artery thrombosis including aortic and renal thrombi, as well as acute oxygenator failure.,,, To minimize the risk of HIT, our institution utilizes bivalirudin as standard on ECMO due to its short half-life and titratability, although many other regimens are in use. To the best of our knowledge, this case represents the first report of acute renal failure being caused by HIT-induced renal vein thromboses in an ECMO patient. Although thrombocytopenia is common in critically ill patients requiring mechanical support following cardiac surgery, a high index of suspicion is required to make a timely diagnosis and to initiate treatment. Clinical scoring systems such as the 4T score can contextualize testing for PF4/H antibodies and aid in diagnosis. Despite increased usage of ECMO globally, variability in anticoagulation practice remains. Although HIT on ECMO is uncommon, providers should take this into consideration when selecting anticoagulants, particularly if extended periods of support are necessary. Esper SA, Levy JH, Waters JH, Welsby IJ. Extracorporeal membrane oxygenation in the adult: A review of anticoagulation monitoring and transfusion. Anesth Analg 2014;118:731-43. Pollak U, Yacobobich J, Tamary H, Dagan O, Manor-Shulman O. Heparin-induced thrombocytopenia and extracorporeal membrane oxygenation: A case report and review of the literature. J Extra Corpor Technol 2011;43:5-12. Selleng S, Selleng K. Heparin-induced thrombocytopenia in cardiac surgery and critically ill patients. Thromb Haemost 2016;116:843-51. Warkentin TE. Heparin-induced thrombocytopenia in critically ill patients. Semin Thromb Hemost 2015;41:49-60. Lo GK, Juhl D, Warkentin TE, Sigouin CS, Eichler P, Greinacher A, et al. Evaluation of pretest clinical score (4 T's) for the diagnosis of heparin-induced thrombocytopenia in two clinical settings. J Thromb Haemost 2006;4:759-65. Chevalier J, Ducasse E, Dasnoy D, Puppinck P. Heparin-induced thrombocytopenia with acute aortic and renal thrombosis in a patient treated with low-molecular-weight heparin. Eur J Vasc Endovasc Surg 2005;29:209-12. Welp H, Ellger B, Scherer M, Lanckohr C, Martens S, Gottschalk A, et al. Heparin-induced thrombocytopenia during extracorporeal membrane oxygenation. J Cardiothorac Vasc Anesth 2014;28:342-4. Ratzlaff RA, Ripoll JG, Kassab LL, Diaz-Gomez JL. Acute oxygenator failure: A new presentation of heparin-induced thrombocytopenia in a patient undergoing venovenous extracorporeal membrane oxygenation support. BMJ Case Rep 2016;2016. pii: bcr2016218179.